The simplest definition of nepotism is “favoritism shown to family members by those in power or influence”. The word nepotism comes from the Latin word “nepos” which means nephew. Its name originated within the Catholic church when certain popes and bishops, having pledged celibacy and having no children of their own, gave preferential treatment to their nephews much like a father would to his own son. They often elevated nephews to the position of cardinal in hopes of continuing a papal "dynasty." 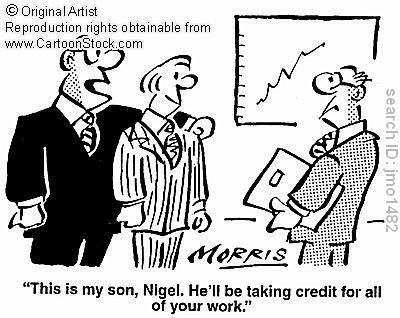 Today nepotism is a practice typically found in business and politics. Nepotism in the workplace is not uncommon and occurs when a family member is promoted over other employee candidates simply because of their relationship to the “boss” or the one in charge. As well, nepotism can be assumed when a public figure is appointed to a position despite the fact that his qualifications do not measure up to those of his competitors. It is likely that a family member in a position of power has pulled some strings to get his family member “in“. While most would agree that it is unfair for an employer to hire or promote a family member over other workers, it would be far more disagreeablefor a public servant to fall to the same temptation. And yet, in American politics it seems to be a widely accepted practice. Adam Bellow, author of In Praise of Nepotism, agrees. "If Americans didn't believe in nepotism, George Bush and Hillary Clinton would not be as popular as they are." Paper Masters writes custom research papers on Nepotism and look into the favoritism shown to family members by those in power or influence.